The engineering of new proteins with novel structures and functions is one of the grand challenges facing the scientific community. This goal is particularly tempting, because we can look to nature to see thousands of working examples of proteins that spontaneously fold and perform diverse functions. By looking at natural proteins, scientists have discovered many of the features that are required to create a functional protein, and now, researchers at PSI have proven that these rules may be used for design. Proteins do not appear to fold in an ordered, stepwise manner. This would just take too long, given the long length of typical protein chains and the many conformations they can potentially adopt. Instead, everything happens at once, and a protein can reach its final form through many different pathways. This process has been termed a "folding funnel", with many different intermediate conformations all converging to one final structure. The trick of protein design is to discover the rules that lead to this type of energetic funnel, without having conformations that get stuck in improper folds. 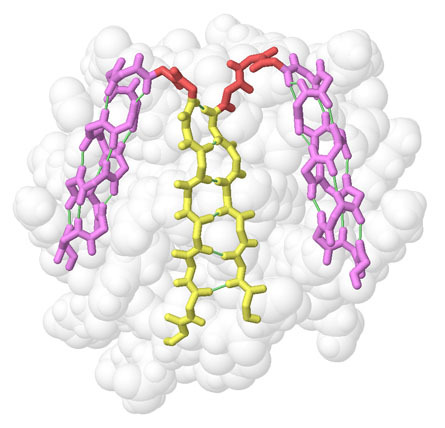 By studying the structures of many existing proteins, and performing many folding simulations, researchers have discovered a variety of rules for designing proteins that will fold. Many of these rules relate to the amino acid sequence, and have been known for many years, such as the preference for hydrophobic amino acids to be inside. More recently, however, researchers in David Baker's laboratory at the University of Washington have discovered a series of rules that aren't based on sequence, but instead define the optimal sizes of loops that connect different secondary structure elements and favor a particular type of folding. An example of one rule is shown here, with the loops in red: shorter loops prefer to direct an alpha helix (magenta) on one side of a parallel beta sheet (yellow), and a longer loop directs the helix to the other side. The PSI Community Outreach Program has proven the effectiveness of these rules through the synthesis and structure determination of five novel proteins. The design started with five different folding topologies from natural proteins, and then entirely new protein sequences were designed to fold into these topologies. 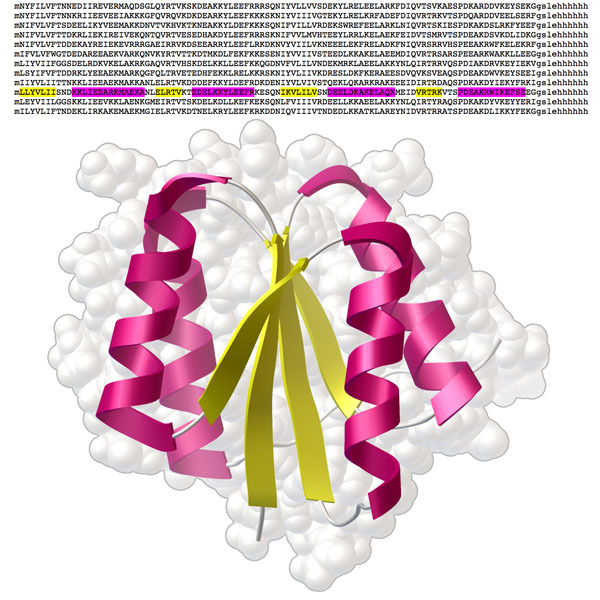 The efficient structural pipeline at NESG was brought to bear, and the predicted protein sequences were synthesized, characterized, and ultimately, structures were solved by NMR spectroscopy. 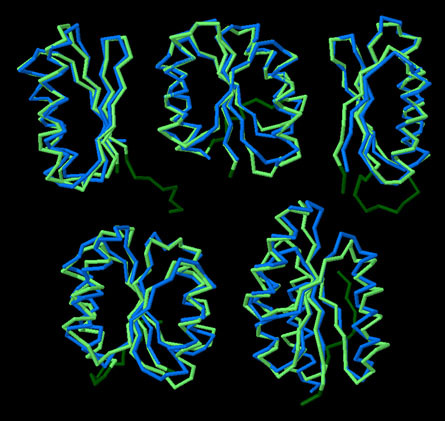 In all cases, stably-folded proteins were obtained (PDB entries 2kl8, 2lv8, 2ln3, 2lvband 2lta). To compare the predicted structure with the structure of the actual protein, click on the image for an interactive Jmol. Five designed proteins are included in this Jmol, with the predicted structure in blue and the NMR structure in green. Use the buttons to switch between the different structures. The chains in the NMR structures are a bit longer, because a string of histidines was added to assist with purification of the protein. Koga, N. et al. Principles for designing ideal protein structures. Nature 491, 222-227 (2012).